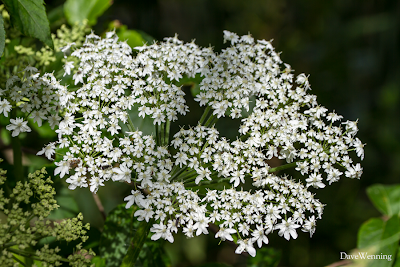 The Cow Parsnip (Heracleum lanatum, H. maximum) in the Carrot family is a spectacular wildflower. As its name implies, it accomplishes herculean proportions. It can grow to 8 feet (>2 meters) in height and the flower heads can be a foot (30 cm) across. The leaves are even larger. They can be found growing from sea level to subalpine elevations throughout most of North America. 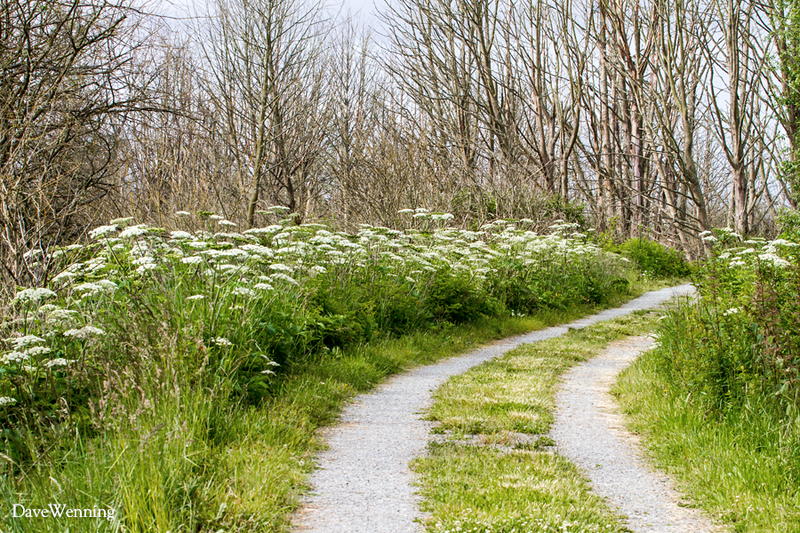 All of the plants pictured here are growing along the dike at Wiley Slough in the Skagit State Wildlife Recreation Area. They also grow along the road where I live. This year's display is especially impressive. Greater than normal rainfall could be the explanation. My weather station measured 2.64 inches (670 mm) of rain for April and 2.51 inches (640 mm) in May. This is 1.66 inches (420 mm) above average for the two-month period. I learned something important researching for this post. 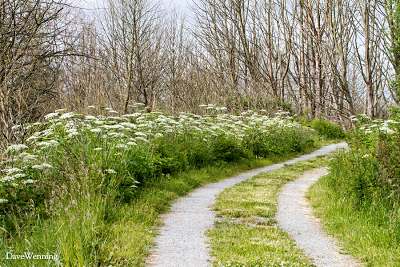 As in the photo, the plants like to grow along trails and roadsides. This provides opportunities for hikers and runners to brush up against them. This should be avoided at all costs. A group of chemicals called furanocoumarins are found in the sap and outer hairs. 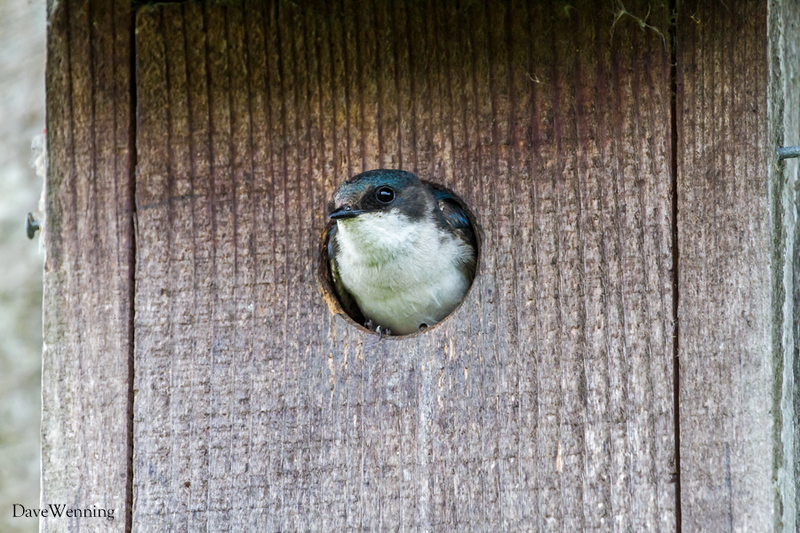 On the skin, they can produce a rash after exposure to heat and/or sunlight in sensitive individuals. The burning, itching and blistering can be intolerable and may recur over several months. I have not experienced this personally, but now that I know about it, I will be more careful around the plants. The giant compound flower is called an umbel because it is like an umbrella ("umbelliform") with spokes extending from a common point. This perennial will die back every fall, but the giant seed heads will be held on the stems well into winter. Close inspection of the flower heads revealed them to be alive with insects of all sorts. Based on range, color pattern and elevation (here basically sea level), I have tentatively identified this bumble bee as Bombus mixtus, the Fuzzy-horned Bumble Bee. See if you agree (.pdf). Then look just below the center of the photo. Can you spot the two tiny beetles also making a living on the flower? Can anyone ID them? Here's a nice video I found of B. mixtus in action. 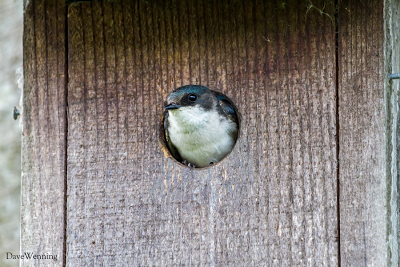 This Tree Swallow occupying one of the many nest boxes along the Spur Dike Trail probably has some new mouths to feed. Plants that are attractive to insects become elements in the food web. 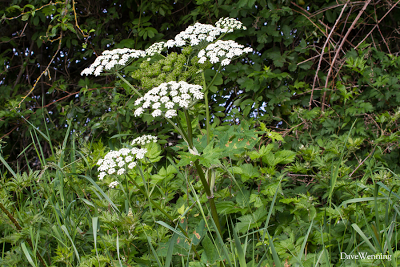 The Cow Parsnip supports many species of insects which in turn become food for birds. 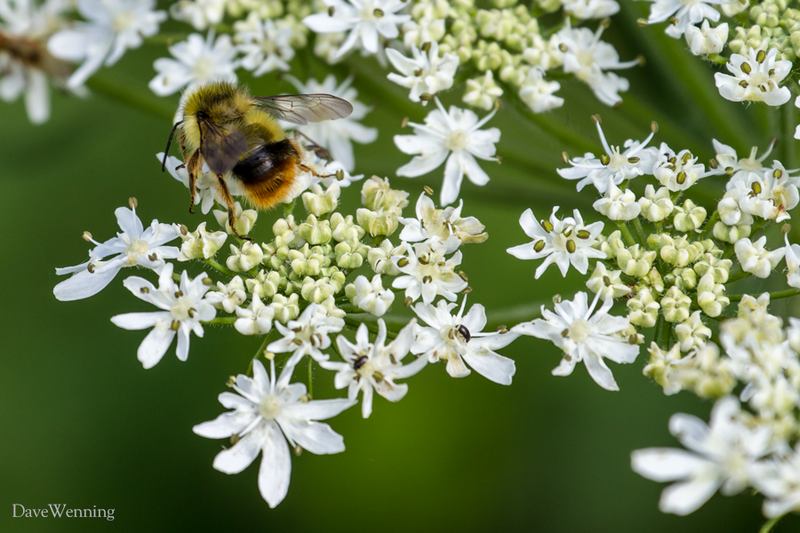 This illustrates one reason why the Cow Parsnip is more than just a pretty flower. It is an important part of a balanced ecosystem. 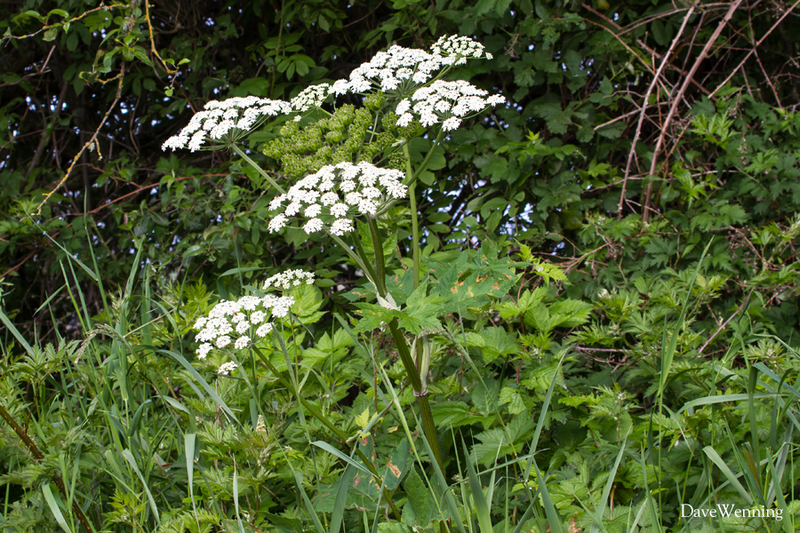 Nice to know about the Cow Parsnip... never knew that it would be so nasty to touch. It is glorious to look at.